Preface: After the "Anonymous Poems Workshop" of January 31, Pinsky asked the students whether they would like to do it again. They overwhelmingly responded "Yes!" So Pinsky asked us to submit another anonymous poem when he's back on Wednesday, February 14. None guessed my poem "Small Talk" which surprised even Pinsky, so I wondered what to do for an encore. Several of the poems on my drawing board were clearly so philosophical that would lead to easy identification. When I went to see the film Cat People (1942) at the Stanford Theatre on February 9, the opening scene with the Serbian fashion artist Irena (Simone Simon) sketching a panther pacing back and forth behind the bars reminded me of Rilke's "The Panther" (1902). Forty years separated the poem and the film, hence forty lines in this poem. Forty is also the symbol of transformation (Noah and the Flood, Moses on Mt. Sinai, Christ in the Desert) and the transformation theme haunts Irena who believes that she'll change into a panther if emotionally aroused by a kiss or jealousy. Transformation is also a major theme in Rilke's poetry as the last line in his "Archaic Torso of Apollo" (1908) "You must change your life." Rilke's interaction with Rodin as his secretary (1902-1903) changed his writing style. Rodin recommended Rilke to visit the Paris Zoo to cure his writer's block. "What should I do there?" the young 27 year-old poet asked the 62 year-old master. "Just look" Rodin tells Rilke, "until you capture the essence of the animal." This kind of "in-seeing" is precisely what Basho recommended to his students in Kawazu Awase (1686) to "become one with the bamboo" if you wish to write about it. "The Panther" (1902) is Rilke's oldest poem in New Poems (published in 1907) where Rilke's poetry veered in a new direction of acute observation of objects and "in-seeing". I've blended scenes from the Cat People film, fantasizing that Rilke meeting Irena sketching the panther at the zoo as the basis of his first poem in Paris. I've changed the zoo setting to a carnival because Pinsky and the Stanford students will readily identify this as my poem since I wrote a poem about the Maguari Stork at the San Francisco Zoo for his February 24 Workshop. I hope this change will sidetrack the class so they'll not pin me down as the anonymous poem's author. After finishing my poem, I gathered six books on Rilke from the Stanford stacks at Green Library (40 paces from my work desk) to learn more about Rilke's experience with Rodin. I've typed up these notes not as an explanation to my poem, but as references in learning more on the influence of a great artist on a young poet who became truly great. After sending my anonymous poem to Ryan Jacobs of the English Department for assembly at 10 pm, Feb. 12, I realized that the font Times and format (40 lines in ten 4-line stanzas) were identical to my previous anonymous poem "Small Talk" which will be easily identified as my poem. So I changed the font to Charcoal, size=9, to imitate the charcoal sketch of the Cat People film, hoping to lend some synchronicity of my poem to the dark image of the panther. This revised version was sent 1:30 pm Feb. 13 which Ryan acknowledged receiving to be included in the "Anonymous Poems" for Pinsky's class. I find it amusing that Rilke surrounded by blocks of marble in Rodin's studio is having "writer's block". Rilke was admiring and adoring Rodin's sculptures so much and not realizing that those blocks of marble were blocking his own poetic juices from flowing out. Curiously, it was when Rilke ventured outdoors away from the confines of Rodin's studio that his writing blossomed. 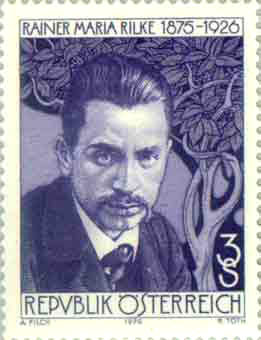 Rilke relied on divine inspiration for his poetry. Rodin's motto was "travailler, toujours travailleer" (work, always work). Being such an admirer of Rodin and his prodigious productivity day in and day out, Rilke began to model himself after the sculptor's work style. Rodin's former pupil Clara Westhoff became Madame Rilke (April 28, 1901). Rilke had a great deal to learn from Rodin, Rodin almost nothing from Rilke. The one, at 27, was still a little-read poet, quite unknown in Paris. The other, at 62, had been a famous sculptor for a long time. Rilke was in awe of Rodin from the start and did not waver in his admiration for the artist even after the man had shrunk somewhat in his esteem. Rilke arrived in Paris at the end of August 1902. By September 2 he was able to report to Clara, who had been left behind temporarily in Westerwede: "Yesterday, Monday afternoon at three, I was at Rodin's for the first time. The studio at 182, rue de l'Université... He dropped his work, offered me a chair, and we talked. He was extremely kind and gentle. And I felt as if I had known him forever... I like him very much. That I knew immediately. We discussed a number of things... Then he went back to work and invited me to have a look at all the things standing about in the studio." Rodin was greeted each morning by his blocks of marble, while Rilke lamented that the only things waiting for him were his pencil and paper. No new strength flowed into him from teh material itself. He had to rely completely on his own imagination and could only train himself in patience and concentration. Also, Rodin's way of looking at things, which did not depend on a first or second or tenth impression but on countless precise observations that ultimately coalesced in the rendering of the timeless and archetypal, was very different from Rilke's working method; for at that time the poet still relied on an impressionistic re-creation of feelings. In the final instance, the one concerned himself with spatial and visible, the other with verbal and imaginary relationships... It would be a long time before Rilke could adopt even for brief periods Rodin's answer: "En travaillant" "Through his work!" Only in one respect did the older man's advice and example have an immediate effect: in the care with which Rilke handled his material, the German language, from this point on. It was in Paris, of all places, that he first got his hands on the Grimm Brothers' German Dictionary and began to study it systematically in an attempt to wrest from individual words both the broadest range of meaning and the greatest possible semantic precision... Rilke told Clara: "This is what matters: not to be content with daydreaming, making resolves, keeping in the right mood, but to turn everything into an object, by force if necessary. As Rodin has done." It is interesting that Pinsky's first words to the class (Jan. 10, 2007) was quoting Yeats' "Sailing to Byzantium" (1926): "Nor is there singing school but studying / Monuments of its own magnificence; / And therefore I have sailed the seas and come / To the holy city of Byzantium." The young Rilke was fortunate to have Rodin showing him the great cathedrals of Paris these "monuments of magnificence" became "the singing-masters" of Rilke's soul and molded him into a great poet. pacing back and forth in his cage, with an organ-grinder playing nearby. He's German, she's Serb Rainer Maria Rilke (December 4, 1875December 29, 1926) is generally considered the German language's greatest 20th century poet. He was born in Prague, Bohemia and died In Switzerland. Simone Simon (April 23, 1910February 22, 2005) was a French film actress who began her film career in 1931. She was born in Béthune, Pas-de-Calais, France and died at age 94 in Paris, France. 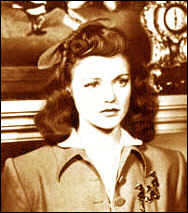 In the film Cat People (1942), she played the role of a Serbian fashion artist working in New York City. Simone Simon grew up in Marseille. She came back in Paris in 1931 and worked briefly as a singer, model and fashion designer. She was 16 years old when Rilke died. Since Rilke left Paris in 1910, they could not have run into each other. After seeing the opening scene in the Cat People film on February 9, I imagined Rilke's encounter with Irena sketching the panther at the zoo as the inspiration of his "Panther" poem 40 years earlier in Paris. 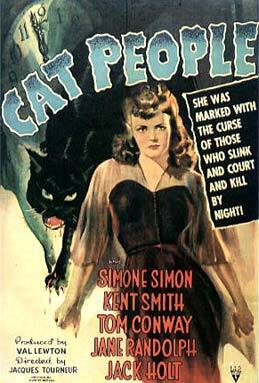 In a Life magazine interview (Feb. 25, 1946), Lewton aptly expressed the reason for his success with Cat People when he said: "I'll tell you a secret: if you make the screen dark enough, the mind's eye will read anything into it they want! We're great ones for dark patches. The horror addicts will populate the darkness with more horrors than all the horror writers in Hollywood could think of." Rilke could not stifle his feeling without denying himself, and, in poetry as in life, he was always ill at ease with the purely factual. The way in which emotion is introduced is subtle and controlled, but it is there. He does not know that the fixed gaze of the panther betokens frustration; he infers it. There are not really a thousand bars to the cage; it is only by projecting himself into the existence and movements of the animal, by the operation of the creative vision, that the image is expanded into something greater than the object actually seen by the eye. Leconte de Lisle would have been content to record the animal walking in circles; but Rilke sees the repeated, monotonous movement as a dance, at the centre of which is a great will. And Rilke does not know that the beast takes in a visual impression proceeds through the muscular limbs to the heart. It is this constant working of the poet's inner vision, the unobtrusive, scarcely perceptible commentary of the imagination, raising and transmuting the physical into the stuff of mind and the emotions, which gives the poem its distinctive character and prevents it from becoming a mere statuesque portrayal. In this way, Rilke retains his poetic individuality and integrity even while obeying Rodin's counsel and honouring his methods. huge a hundred thousand places that are all alive, active, and different. paws, and simultaneously that caution in which all strength is wrapped, that silence. Panther: Christian: The panther was said to save people from the dragon or Evil One. As supposed to have sweet breath, it typified the sweet influence of Christ. Heraldic: The panther is usually incensed and signifies fiercesness; fury; impetuosity; remorselessness. displays and games in the arena. More on Panther Mythology from the Web. Kenneth S. Calhoon, "The Eye of the Panther: Rilke and the Machine of Cinema"